The prologue in the earliest 17th century Italian operas was a way to introduce and explain the opera, rather than plunging straight in. So that in Monteverdi's L'Orfeo, the figure of La Musica explains that she has come down from Parnassus to tell the story of Orfeo. In these early operas, there was also the need to glorify, compliment and otherwise flatter the patrons and commissioners of the operas. Whilst opera in Italy changed quite a bit during the 17th century, the prologue remained something of a fixture. 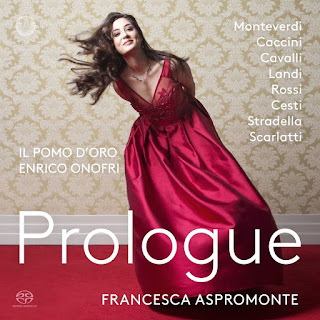 On this lovely new disc from Pentatone, soprano Francesca Aspromonte joins Il pomo d'oro, director Enrico Onofri, for a programme of prologues starting with Monteverdi, working its way through Cavalli, Landi, Rossi, Cesti and Stradella to Alessandro Scarlatti. Monteverdi's prologue to L'Orfeo is the classic of the genre, and rightly Aspromonte opens with this, preceded by the Toccata. She has a focused, forward soprano which has an expressive directness to it. She and Onofri perform with great fluidity and flexibility, words are paramount with Aspromonte really shaping the lines to the words. The earliest operas were highly fluid in their attitude to text and music and this really shows in this performance. In all the pieces Aspromonte combines a vibrancy of attitude with a vividness of detail which really engages, and she brings a fine range of colour to the voice. As a result, it is quite surprising how engaging and engrossing this programme is. We hear two of the earliest operas, Monteverdi's L'Orfeo (1607) and Giulio Caccini's L'Euridice (1602), where the prologues serve to introduce and explain, very necessary with such a brand new and unusual art-form. With the operas by Francesco Cavalli written for the commercial theatre in Venice, there would seem less reason to explain the opera, no longer a novelty and with no patrons to flatter, but the prologue seems a fixture and here they often serve to provide a gentle introduction to the story. We hear prologues from three Cavalli operas written for Venice, La Didone (1640), L'Eritrea (1652), and L'Ormindo (1642) but also from operas by other composers which were premiered elsewhere. From Rome, we hear Stefano Landi's Il Sant'Alessio (1632) and Luigi Rossi's Il palazzo incantato overo La guerriera amante (1642). With Pietro Antonio Cesti we move into the second half of the century, with L'Argia (premiered in Innsbruck in 1655) and Il pomo d'oro (premiered in 1668 in an open air theatre in Vienna). Finally, there is Alessandro Stradella's Con meste luci which seems to have been written as a stand-alone piece to fit any opera (! ), and Alessandro Scarlatti's Gli equivoci in amore, o ver La Rosaura (premiered in Rome in 1690). What we hear also as we progress through the century is how the composers' ideas of what constituted a prologue changed. Landi's prologue is rather stately and more formal than those of Monteverdi, Caccini and Cavalli where fluidity and flexibility tell. With Rossi's prologue, we start to feel that we are listening to an aria/recitative sequence rather than something looser and this continues with the two Cesti operas. With Stradella and Scarlatti we reach much more of a composed scene, each almost a cantata which would function well on its own. Many of the prologues are given with the opening sinfonias, and another Stradella sinfonia is added so that in addition to admirably supporting Francesca Aspromente we get to hear the orchestra in its own right. The CD booklet includes articles by Francesca Aspromonte and Enrico Onofri, along with an introduction to the music from Tim Carter. I was completely captivated by this disc, Francesca Aspromonte, Enrico Onofri and Il pomo d'oro have taken an idea which could have been rather academic and dry and created a vividly engaging sequence of music. Aspromonte engages with the text with great vibrancy, yet she never feels as if she is going over the top. Perhaps the text of a good prologue is the idea that you are keen to find out what happens next, and certainly, on this disc I couldn't wait for the next track. Recorded at the Teatro delle Voci, Treviso, 19-22 December 2016.